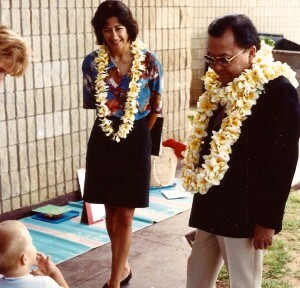 After the 1986 election, Senator Inouye called me and asked me to be his professional staff for Native Hawaiian issues on the Senate Select Committee on Indian Affairs, to which he had just been appointed chair. I had lost my previous job when my boss lost his bid for governor and was already co-producing a television series on Native Hawaiian issues in Hawaiʻi. 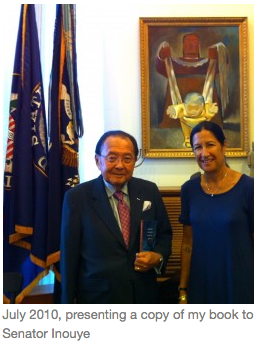 I asked Senator Inouye if he could wait until the following June for me to start, and he did. During that period between 1987 and the time I returned home again in 1992, to work on his Honolulu staff before branching out on my own, the committee passed significant legislation that directly benefitted Native Hawaiians. The Native Hawaiian Education Act, The Native Hawaiian Health Care Act, The Native Hawaiian Revolving Loan Act, the Native Languages Act and the Native American Graves and Repatriation Act were among the significant bills that I staffed during this time, each one of them the law of the land today. At the markup of the Native Languages Act legislation in his committee, I was staff for the bill and was about to respond to Senator Slade Gorton’s criticism of perpetuating Native American languages when Senator Inouye, who was chairing the committee took control and responded. He gave the most eloquent and extemporaneous speech I have ever heard. Sitting in awe, I listened to him undress Senator Gorton, first his clothes, which he piled up neatly, then his skin, then he took his bones apart and laid them in a precise little pile. There was nothing left of Senator Gorton, and while he still didn’t vote in favor of the bill, it passed overwhelmingly by the rest of the committee. It was moments like this that I will never forget. He was one of the smartest men I have ever known, even when he lectured me one day, as I sat with my arms and legs crossed, refusing to look at him, about why the military needed Kahoʻolawe for target practice. He changed his position later (not because of me) and was instrumental in returning the island to the Hawaiian community. The last story he told me when I visited him in Washington in July, 2010, was about his encounter with a “shark god”. Here is the story as I wrote it out after our meeting: When he was in the Hawaiʻi territorial legislature, Kamokila Campbell came to him for help. She was having problems with the IRS because she was giving lots of money away to kupuna. She said she couldn’t pay him to help her. Even though they were on opposite sides of the Statehood issue, he said he wasn’t expecting pay and would help her. He fixed her problems and after, she used to call him once or twice a month. He went to visit her at Lanikuhonua and she explained to him that this place was very sacred because it was the home of a shark god. She took him down to the water and he waded in. A shark swam in the cove and came within about 10 feet of him and stopped. When the old women who were gathered saw the fin they started wailing “auwe”. He stood, the shark stayed awhile, then turned around and swam away. He thought 2 things: it’s too shallow for the shark to come closer and bite me, and I better not move or I’ll cause a frenzy. After the shark left, Kamokila told him that it was a blessing. My take on his story, as I told him after listening to it and its amazing similarity to the opening of my book, “Between the Deep Blue Sea and Me”, which I had just given him, was that it was one great leader greeting another. Aloha ʻoe, Senator, and mahalo for your inspiration, for your brilliance, and for the gift of being able to work for you.